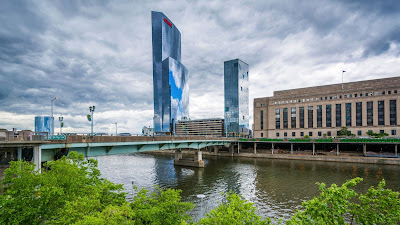 On October 26 the City of Philadelphia and the Delaware Valley Green Building Council announced the launch of the Philadelphia 2030 District, a voluntary private initiative to reduce building energy and water use and transportation emissions by 50 percent by the year 2030. “Really, this impacts everyone because unless we can get a handle on carbon emissions, and seriously reduce them, climate change is going to have an impact on the whole city and the world,” said Alex Dews, executive director of the DVGBC. The district is currently limited to University City and Center City, where there is a large concentration of buildings that tend to be the biggest energy consumers in the city, although Dews says there are plans to expand the area down the road. The average commercial building in Philly wastes 30 percent of its energy, while 60 percent of carbon emissions are produced by the building sector. Some organizations including SEPTA and Drexel, as well as the City of Philadelphia, have already signed onto the 2030 commitment. Developer Brandywine Realty Trust also committed to the pledge early on; a number of its new buildings, including the FMC Tower and Cira Centre fall within the district and include not just commercial developments, but also residential properties. Each year, the DVGBC will release an annual progress report to see if companies and organizations are meeting their pledged goals. Philly is now among 18 cities in the country to commit to this national initiative known as Architecture 2030, with 15 million square feet committed to the pledge. Dews hopes that number expands now that the program has officially launched; there is a total of 120 million square feet of properties within the district that could commit to the pledge, he says. The commitment of private organizations and companies to energy reduction is the latest in a series of recent city efforts to combat climate change. Last month, the city released its own Philadelphia Municipal Energy Master Plan, a multi-step roadmap to reduce energy use and clean the city’s energy supply. It also has a goal to reduce greenhouse gas emissions from the city’s buildings in half by 2030. Earlier this summer, Philadelphia Mayor Jim Kenney signed onto the Mayors for 100 percent Clean Energy effort spearheaded by the Sierra Club. The commitment for Philly to transition to 100 percent renewable energy came on the heels of the White House’s move to reject the Paris climate accord. For more information, visit the Philadelphia 2030 District webpage.